Written By: Lcsw Paul R. Fine, Amy J.L. Baker, Ph.D. There's no question about it: your children are the most important thing in your life. But if you have gone through a messy divorce, your relationship with your children may become strained if you have to deal with a toxic ex. Your ex may bad-mouth you in front of the kids, accuse you of being a bad parent, and even attempt to replace you in the children's lives with a new partner. As a result, your children may become confused, conflicted, angry, anxious, or depressed-and you may feel powerless. 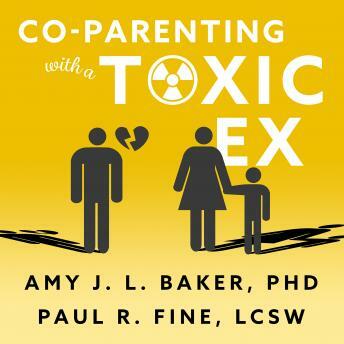 In Co-parenting with a Toxic Ex, a nationally recognized parenting expert offers you a positive parenting approach to dealing with a hostile ex-spouse. You'll learn to avoid the most common mistakes of co-parenting, how to avoid 'parental alienation syndrome,' and effective techniques for talking to your children in a way that fosters an open and honest response. In addition, you'll learn how to protect your children from painful loyalty conflicts between you and your ex-spouse. by Lcsw Paul R. Fine, Amy J.L. Baker, Ph.D.